A week has now passed since Poland’s president defied international pressure and signed a highly controversial piece of legislation that outlaws blaming Poland for Holocaust crimes. As of this writing, the law has not yet taken effect. 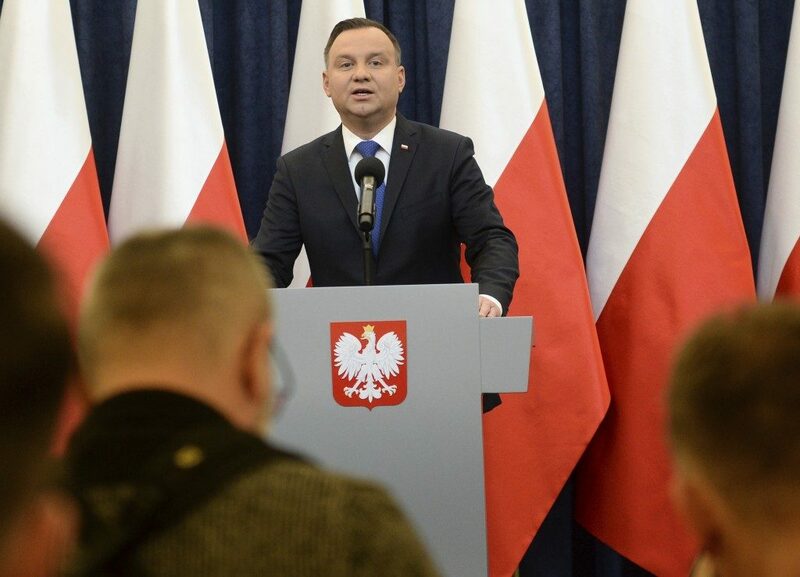 That will first happen 14 days after it is officially published, and President Andrzej Duda has said he will ask Poland’s constitutional court to evaluate the bill — leaving open the possibility that it could still be amended. While the Polish government continues to insist that the bill is not intended to protect “individual” Poles who were complicit during the Holocaust, the wording of the new law is murky, to say the least. The only exemptions are “artistic or scientific activities.” Precisely how Poland defines these terms remains to be seen. Nor is it clear how Polish authorities, their current denials notwithstanding, would seek to define the actual boundaries of this law in the months and years to come. What is, however, all too apparent is that anti-Semitic rhetoric, which was long part of the discourse on the political fringes, has now moved into the mainstream. Conservative lawmakers and commentators are now openly alleging that the real reason Israelis and American Jews are so opposed to this law is that they want to use this issue as a pretext for getting money from Poland for prewar Jewish property seized by the Poles during the communist era. Jerzy Czerwinski, a senator with the ruling party, asserted that he saw a “hidden agenda” in the opposition. Their attempts to conflate these two wholly separate — albeit both very disturbing — issues is a telling sign of just how far some Poles are prepared to go in their flight from historical reality. Jews lived in Poland for a thousand years. Although Jewish life flourished in pre-war Poland, and many of the citadels of Torah and Chassidus were based in Polish cities and towns, anti-Semitism was rampant. The fact that some six thousand Poles are numbered among the Righteous Among the Nations, and deserve our eternal gratitude for risking their lives to save Jews during the Holocaust, is undeniable. But so is that fact that many other Poles brutally collaborated with the Nazis, and played a role in the murder of many thousands of Jews. France, a country that itself has yet to come to terms with its own tortured past, joined Israel and the United States in denouncing the bill. “This law is ill advised, you should not rewrite history, it’s never a very good idea,” said Foreign Minister Jean-Yves Le Drian. “I also hope that the Polish people will reconsider, and in the next elections act in a way that removes the unfortunate political straitjacket imposed by nationalist factions,” he said. “Anything that could pervert this memory is negative,” Le Drian added. The rising tensions between Poland and Israel, as well as between Poland and the global Jewish community, is deeply worrisome on many grounds. But ultimately, what needs to be recognized is that this isn’t a conflict between countries and peoples, but rather a struggle between a Polish nationalism movement eager to rewrite history — and a truth that they are so desperate to erase. Instead of seeking to silence others, Poland would do well to own up to its past. It has every right to object to terms like “Polish death camps,” as well as to highlight the thousands of righteous Poles who saved Jews. But efforts to ban an open and honest discussion of its past, as well as the mounting expressions of open anti-Semitism, have no place in a civilized society. There is still at least a week until the law goes into effect. It is not too late to bring this debacle to an end. All it will take is some good will — and a dose of honesty.